There are 1,914 miles separating Abilene and Cranston, Rhode Island. The 29-hour drive crosses nine state lines and takes you from the east coast all the way to the west Texas dirt. Yet, even with the large separation, a connection can be found in the most unlikely of ways. Junior cross country athletes Alexandria and Michaela Hackett have found a home in Abilene as two of the top runners for the Wildcats this year. The Rhode Islande natives have more in common than just the success they’ve received this year. The Hackett’s performances were good enough to gain attention. From a small Christian college in west Texas, former cross country coach Chris Ward emailed the twins and invited them to campus. Although ACU may have been foreign to Alexandria and Michaela, the area of west Texas was familiar to the girls. The Hackett’s aunt had married a man from Texas and the two had settled 90 miles south of Abilene in San Angelo. The girls began taking trips there when they were 11, so although Abilene was new territory, west Texas was already a second home. The twins have become a force for the Wildcats through the team’s first three competitions of the year. In the season-opening Bill Libby Invitational at McMurry, Alexandria took second overall and Michaela grabbed the fourth place finish as the sisters led the Wildcats to a first place sweep. Two weeks later, Alexandria recorded her first win as a Wildcat with a first-place finish at their home invitational. Michaela was not far behind with a fifth-place finish. Alexandria earned Southland Conference athlete of the week honors with her second-place finish at the Texas A&M Invitational, where the twins went up against competition from the SEC, Big 12 and Southland Conferences. Cross country may be the path that the Hackett’s have chosen, but it certainly wasn’t the fist they tried. Growing up, both sisters tried several sports and were very active. 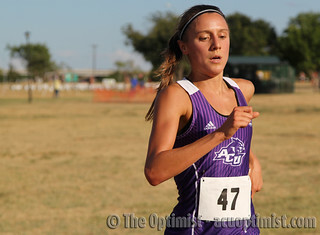 Thankfully for ACU, the two of them decided to stick with cross country. After a less than thrilling season, the expectations were not too high for the Wildcats coming into the 2015 campaign. “I think it’s going really well based on what we have already done at the three meets, because we have gotten consecutively better and I think we are going to keep that streak,” Alexandria said.